Described by founder Mike Johnson as an “enterprise” rather than a band in the conventional sense, Thinking Plague seem to fit the definition of “cult act” to a T. The many different incarnations of the US answer to seminal European outfits such as Henry Cow and Univers Zéro – based in the rugged mountain state of Colorado, where it was formed by Johnson and guitarist/drummer Bob Drake in 1982 – read like a veritable “who’s who” of the US avant-progressive scene. Thinking Plague’s whole existence has also been characterized by a constant struggle against circumstances, which has inevitably impacted the frequency of their releases. Indeed, with a total of 7 studio albums released in almost 30 years of history, they definitely count among the least prolific bands on the scene, together with Cuneiform label mates Miriodor. The average progressive rock fan, steeped in the grand symphonic tradition of the early Seventies, usually has a very controversial relationship with the more forward-thinking fringes of the movement – and very few bands are as likely to send prog fans running for the exits as Thinking Plague. Unabashedly intellectual, as their very name (associating the act of thinking with a curse of sorts) suggests, with extremely well-written, thought-provoking lyrics, Thinking Plague take the proverbial complexity of the Avant subgenre up a notch. Decline and Fall, their highly-awaited seventh album, released almost 9 years after A History of Madness, is certainly no exception. The album also showcases the band’s new lineup (though drummer Robin Chestnut, who was introduced on the occasion of Thinking Plague’s headlining appearance at Cuneifest in November 2011, only appears on one track), spotlighting the contributions of new singer Elaine DiFalco (recently seen on two outstanding albums, Dave Willey and Friends’ Immeasurable Currents and 3 Mice’s Send Me a Postcard) and drummer/keyboardist Kimara Sajn, a gifted multi-instrumentalist well-known on the Seattle experimental music scene. Clocking in at under 47 minutes, and entirely written by Mike Johnson, Decline and Fall features 6 tracks connected by a fil rouge made all too clear by the title and artwork – an apocalyptic reflection on the dismal state of Planet Earth, which, according to Johnson’s musings, has long gone past the point of no return. Through vivid verbal imagery flawlessly supported by the head-spinningly intricate music, humankind is depicted as rushing headlong (and heedlessly) towards destruction, its disappearance the only thing that will be able to save the Earth. While the term “concept album” is generally associated with overambitious productions that often collapse beneath the weight of their own pretensions, Decline and Fall is tight and tense, the synergy between lyrics and music embodied by Elaine DiFalco’s stunning vocal performance. Reviews often mention the role of vocals as just another instrument, but the observation is rarely as fitting as in this particular case. DiFalco’s extremely versatile voice ranges from soothing the ear with subdued gentleness to tackling parts of rollercoaster-like intensity, bolstered by the use of multi-tracking to almost vertiginous effect. Though the word “multilayered” frequently crops up in prog reviews, it sounds like an understatement if applied to Decline and Fall. True, the listener might occasionally feel that the music is too clever or intricate for its own good, in a sort of “art for art’s sake” manner, and keeping track of the twists and turns in the compositions is anything but an easy task. 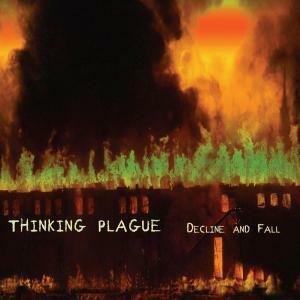 Decline and Fall demands a lot from its listeners, and it is definitely not the kind of music you would want to keep in the background while doing the housework. On the other hand, contrarily to the trend shown by most “mainstream” prog, displays of individual brilliance have little or no place in Thinking Plague’s world. Each instrument, like a thread in a tight, complex weave, gets its chance to shine, but as part of a whole rather than in isolation. Consequently, solo spots are few and far between, though the excellent sound quality brings each contribution to the fore. Similarly, Decline and Fall is best approached as a whole, even if each track has its own distinct personality. Unpredictable by definition, the music can be almost unbearably dense, while at times turning rarefied, almost ethereal. Brisk opener “Malthusian Dances” thrives on Sajn’s commanding percussion work, while Mark Harris’ assertive clarinet spars with Johnson’s guitar. “I Cannot Fly”, a barbed attack on the easy consolation offered by religion, is suitably sparse and dissonant, though fleshed out by Dave Willey’s muscular bass lines – which are also spotlighted in “Sleeper Cell Anthem”, together with Sajn’s solemn, martial drumming. The mesmerizing ebb and flow of the album’s centerpiece, the almost 12-minute “A Virtuous Man”, is so fragmented as to be nearly impossible to describe, and yet oddly cohesive; DiFalco’s voice seamlessly blends with the impossibly complex lines of the music, surging and fading along with it. The shorter, mostly instrumental “The Gyre” introduces closing track “Climbing the Mountain”, an oddly serene, keyboard-driven number enriched by atmospheric mellotron and understated piano whose unexpectedly abrupt ending seems to suggest humankind’s inevitable demise. No matter how clichéd it may sound, the warning of “not for the faint-hearted” is quite fitting for an album such as Decline and Fall. Those looking for catchy melodies, conventionally “beautiful” singing and lush orchestrations are bound to be put off by Thinking Plague’s off-kilter, yet highly reasoned approach to composition, and the undeniably depressing subject matter is unlikely to appeal to fans of the more escapist side of prog. This is not the by-numbers doom-and-gloom typical of many progressive metal bands, but a genuinely dystopian vision of the future of humankind conveyed in strikingly beautiful imagery – a true soundtrack of the Apocalypse. While Decline and Fall is clearly not an easy proposition, it will yield rich rewards for those brave enough to approach it. excellent review darling. I’ve sort of been inspired to check out more of the modern avant-progressive scene thanks to the new upcoming Romantic Warrior documentary. It is a different style than I normally prefer, but I like what I hear. Definitely not running screaming for the exits at least hahah. One of my all time favourite bands. Still waiting for my CD of this to arrive in the mail. I wish I knew how to write music like this! Another fine review, Raffaella.